BRIDGEPORT, CT - The Housatonic Museum of Art (HMA) is proud to announce that it received a $15,000 Art Works award to support its HMA Peer Docent Program. The award is part of over $82 million approved by the National Endowment for the Arts Chairman Jane Chu to fund local arts projects and partnerships. 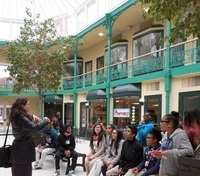 The HMA Peer Docent Program introduces Bridgeport middle school students to art and art history, teaching them to look at art critically and guide classmates during tours. The grant will allow HMA Museum Educators to train ninety students to be docents who will guide 600 classmates on tours of Downtown Bridgeport, CT. 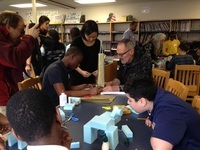 Through the program students develop visual, analytical and critical thinking skills that will assist them across academic disciplines and throughout their lifetimes.